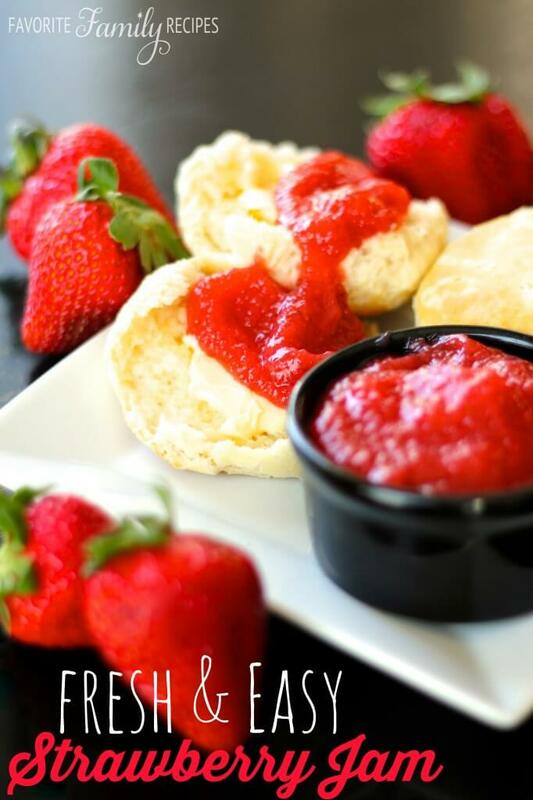 This Fresh and Easy Strawberry Jam is fresh and simple! It doesn’t make up as much as freezer jam and there is no pectin! You are going to love it on toast! I made up this jam to use as a filling in a dessert that I will be sharing next week! I only needed about half the jam for the dessert so we used the rest all week on toast and biscuits. My daughters especially loved it on their peanut butter sandwiches! Some other tasty ideas would be using this on oatmeal or cream of wheat, over pancakes or waffles, or as a sundae topping! I made this using my food processor but you could also use a blender or mash the berries by hand. You can also try adding other fruits, just take out some of the strawberries. Strawberry peach, strawberry banana, or if you are from Idaho strawberry huckleberry also make delicious jams using this recipe. Even though this isn’t traditional freezer jam, it can be frozen for later use. It will keep in the freezer for several months. Pour blended strawberries into a sauce pan. In a small cup, dissolve the cornstarch in the 2 to 3 Tbsp of cold water. Stir until smooth. Before putting the saucepan over heat, whisk the cornstarch mixture into the strawberries. Stir in the sugar then place the saucepan over the stovetop on medium high heat. Bring mixture to a boil stirring constantly. The mixture should thicken. Remove pan from heat and stir in vanilla. It will thicken even more as it cools. Keep refrigerated. I can’t believe how easy this is to make! Imagining everything I can spread this on, sounds so good! Can you be specific as to amount of strawberries after processing. By weight or cups? The size of containers vary by grocery stores. This measurement could through off the jam. I love this recipe!!! Yesterday I tried canning what I had picked the night before, and it was a mess! Wouldn’t thicken for the life of me, even after extra pectin. This is sooo much easier! So glad that you liked it! Definitely easier than trying to can IMO! So, can you freeze it? or put into jelly jars and keep indefinitely in the refrigerator? Either freeze it or use it within 3 to 4 weeks. Yum! This turned out great! I used 4 cups of strawberries and cut the sugar down to 1/2 cup. It filled 11/2 pint size mason jars. Thanks for sharing! Yes, you can use frozen strawberries. The jam will have a slightly different texture, but it will still be good. Make sure you use unsweetened, whole frozen strawberries – not strawberries that are sliced or frozen in syrup. Thaw the frozen strawberries in the refrigerator and then follow the recipe as outlined. Enjoy!